Gold Filled There are 30 products. Material: Gold Filled Cross, Gold-Filled Flat Cable Chain, Swarovski Pearl * How to order * 1. Please select chain length and number of pearl in the drop-down list. Material : Gold Filled Bar, Gold-Filled Flat Cable Chain * How to order * 1. Please select chain length in the drop down list. 2. Please type initial you want to stamp in Product Customization below. ( ex: B ) The Product Customization is at the bottom. Material: Gold Filled Charm, Gold-Filled Flat Cable Chain * How to order * 1. Please select chain length in the drop down list. 2. Please type initial you want to stamp in Product Customization below If you select 'stamped'. ( ex: B ) The Product Customization is at the bottom. 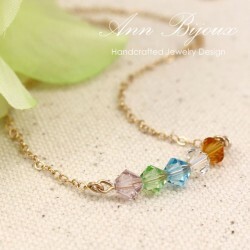 Material: Gold Filled Bar, Gold Filled Chain, Swarovski Birthstone * How to order * 1. Please select chain length and letter color in the drop down list. 2. Please type initial you want to stamp in Product Customization below. ( ex: B ) The Product Customization is at the bottom. Material: Gold Filled Disc, Gold-Filled Flat Cable Chain, Swarovski Pearl * How to order * 1. Please select chain length and letter color in the drop down list. 2. Please type initial you want to stamp in Product Customization below. ( ex : R ) The Product Customization is at the bottom. Material: Gold Filled Bar, Gold Filled Chain * How to order * 1. Please select chain length from in the drop down list. 2. Please type initial you want to stamp in Product Customization below If you select 'stamped'. ( ex : D ) The Product Customization is at the bottom. Material: Gold Filled Disc, Gold Filled Charm, Gold-Filled Flat Cable Chain * How to order * 1. Please select chain length and letter color in the drop down list. 2. Please type initial you want to stamp in Product Customization below. ( ex : D ) The Product Customization is at the bottom. Material : Gold Filled Disc, Gold Filled Charm, Gold Filled Flat Cable Chain * How to order * 1. Please select chain length, letter color and birthstone color from the drop down list. 2. Please type initial you want to stamp in Product Customization below. ( ex : L ) The Product Customization is at the bottom. Material : Gold Filled Disc, Gold Filled Flat Cable Chain * How to order * 1. Please select chain length, letter color and birthstone color from the drop down list. 2. Please type name you want to stamp in Product Customization below. ( ex : Shane ) The Product Customization is at the bottom. 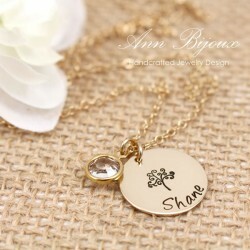 Material : 14K Gold Filled Disc, Charm & Chain * How to order * 1. Please select chain length and letter color from the drop down list. 2. Please type name you want to stamp in Product Customization below. ( ex : Shane ) The Product Customization is at the bottom. 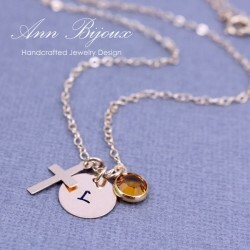 Material : 14K Gold Filled Disc, Charm & Chain, Swarovski Birthstone * How to order * 1. Please select chain length, letter color and birthstone color from the drop down list. 2. Please type name you want to stamp in Product Customization below. ( ex : Ashley ) The Product Customization is at the bottom.